6712090: 11-14 GMC Sierra HD & Denali X METAL Custom Chrome Mesh Chrome Studded Grille. T-Rex Grilles is the leader in cutting edge custom grille designs and has done it again with the new X METAL Series Grilles. Starting with top quality stainless steel, T-Rex Grilles assembles a proprietary wire mesh into a precision laser cut frame surround. The entire grille is then electro polished to a high chrome shine. Then, attractive chrome studs are added to give it that unique custom look that says: "there is no other truck like this in my neighborhood!" 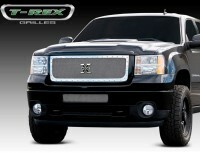 Set yourself apart with the latest in high quality custom grilles from T Rex Grilles. This is the main grille only. Bumper grille is also available above as optional item.